Marlborough senior Joao Mendes (23) looks on as Owen Cappadonna (4) shoots a free throw in Marlborough’s nail-biting, 59-58 victory over Medfield at WPI in the MIAA Division 2 Central Mass semifinal on Sunday. Mendes paced the Panthers with 25 points and added 4 steals and 4 blocks. Marlborough will play Concord-Carlisle in the MIAA Division 2 Central final on Sunday at Fitchburg State University. 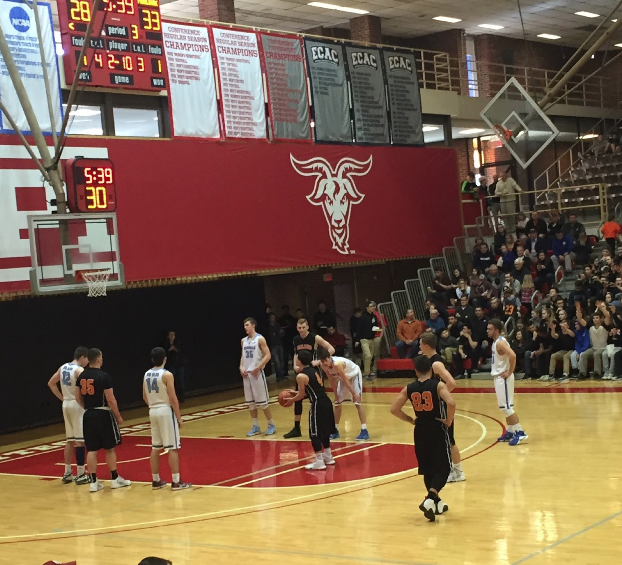 The Marlborough Panthers outlasted the Medfield Big Blue, 59-58, in the MIAA Division 2 Central Mass semifinal at Worcester Polytechnic Institute on Sunday. Joao Mendes provided the offensive and defensive spark for Marlborough (18-4), pacing the Panthers with 25 points. “The ball was dropping for me, and my teammates saw that, and they found me,” Mendes added after his memorable performance. Mendes also played aggressive defense against Medfield (18-4), forcing four turnovers and blocking four shots. Mendes said that the way Marlborough plays on defense translates to offense, adding that Marlborough “gets pumped” when their defense is playing well. “We depend on our defense… stopping the ball, playing help defense,” junior Owen Cappadonna, who provided the Panthers with 7 points, added after the hard-fought victory. It wasn’t always smooth sailing for Marlborough’s defense. John Williams hit two of his four three-pointers in the first quarter, helping the Big Blue jump out to an early 6-2 lead. Five players scored for Marlborough in the first quarter, and the two teams were tied at 15 after the first eight minutes of play. The lead changed hands five times during the second quarter. Marlborough went into the locker room with a 28-25 advantage, courtesy of a play by Mendes that encapsulated his effort on both sides of the ball on Sunday. A wave of Big Blue players was flying toward their basket, following a Marlborough turnover, when senior guard Evan Howells tried to pass the ball over Mendes' head. Mendes knocked the ball down, took one dribble, and drilled a 30-foot shot that gave Marlborough the lead, and momentum heading into halftime. “As soon as it left my hand, I knew it was going in,” Mendes said of his Steph Curry-esque buzzer beater. Marlborough appeared to have taken control of the game early in the third quarter, jumping out to a 40-31 lead with 4:23 remaining. Medfield responded with a 9-0 run to tie the game at forty. Senior Evan Howells (team-high 16 points), junior Christopher McGory (8 points, 7 rebounds), and Senior John Williams (15 points, 7 rebounds) combined for all of Medfield’s points in the third quarter. Mendes and sophomore standout Chris Doherty (11 points, 8 rebounds) made a couple of shots to put the Panthers ahead 46-40 at the end of the third quarter. Medfield came storming back, opening the fourth quarter with a 9-2 run to take a 49-48 lead with 5:20 remaining in regulation. Marlborough and Medfield went back and forth over the final 5:20, with the lead changing sides eight times. Down the stretch, it was Mendes making the key play for Marlborough. With 1:03 remaining, Mendes knocked the ball away from Evan Howells and made a layup on the other end, giving Marlborough a 59-56 lead. With 7.2 seconds remaining and Marlborough leading by 1, Medfield inbounded the ball at halfcourt coming out of a Medfield timeout. Evan Howells missed a tightly contested jump shot, and Marlborough escaped with a victory. Marlborough will play Concord-Carlisle in the MIAA Division 2 Central Championship game on Saturday at Fitchburg State University. Tip-off is scheduled for 11 am. I feel blessed that I have read this article. Mr. Siegel M.d. P.dhw. is a goddamn genius and his writing is beyond me. It's incredible to see that his writing has changed my life completely. At first I would definitely say that I was NOT a Marlborough fan. But now I could definitely say I am. I'm happy for Mr. Seagul that he was able to follow this team from 0-6 to 3000000-1. WHAT A COMeBACK!!!! Their Stanley Cup run is a one of a kind event that has never been seen before. With this kind of intuition and work ethic MR. jason would be a better president than you. Now lets get down to the raw details of this article. -when reading this article what stood out to me first was that in the second paragraph, 7th line. I passed out from pure excitement. I envisioned lizard goddesses swimming around in the ocean. I was plain and simple, a buddah floating on a lily pad. When I awoke from m patchy spirit quest; I could not believe he made that great of a pass. I knew he was good, but not that good. You know? -what also stood out to me was on the 20th paragraph 181st line. It was remarkable to believe that a middle school athlete could make a shot from the moon. Simply unbelievable! Hahahaha! Well, I must admire this commenters passion and imagination... I guess.